I’m always looking to extend my cultural horizons beyond tried and true choices. The Cage Festival, November 8th – 22nd has definitely piqued my interest. Four Victoria arts institutions – the Victoria Symphony, Art Gallery of Greater Victoria, University of Victoria (School of Music) and Open Space – are celebrating the 100th anniversary of John Cage’s birth by hosting a series of concerts, art exhibitions and special retrospectives highlighting this multi-faceted composer, artist, writer and critical thinker. 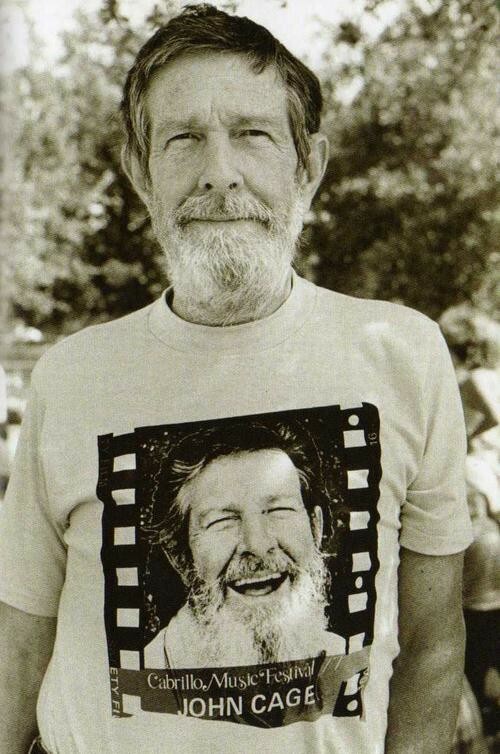 John Cage (1912 – 1992) was an American composer, philosopher and artist. It is impossible to define Cage in terms of a single discipline. It may be that his discipline is simply the imagination, endlessly provoked. Cage is best known for developing indeterminacy as the principal method used for creating his work, whether it be sound, text or image. Many of the events are free, or by donation, and the ticketed events are moderately priced. In this age of trans-media, and remixes, why not investigate the work of a pioneer at combining art forms? Opening of Devoted Play, an exhibition of visual material by/around/concerning John Cage with a reception co-hosted by the Victoria Symphony. Admission to the Opening Event is FREE and open to the public. The exhibit runs until January 6, 2013. On the first Tuesday of each month, admission is free. Devoted Play brings together artifacts which show various aspects of a man now considered among the most influential figures in art and music. Each object illuminates a part of Cage’s world, whether musical, visual, or philosophical: a letter justifying 4’33”, his notorious silent piece; a Japanese zen painting; examples of his own graphic work; and film of the Merce Cunningham Dance Company, with which he was associated for many years. Join the AGGV, Open Space, Victoria Symphony, and the University of Victoria in celebrating the opening of this dynamic season of events, with a performance of John Cage’s Imaginary Landscape No. 4 (1951), for 12 radios by the Uvic Sonic Lab. Essay: Discussion on Cage and Anarchism with Andrew Culver, Cage’s assistant in the 1980s, and Dr. Allan Antliff, professor of art history, University of Victoria. As part of Victoria’s Cage 100 festival, Open Space presents John Cage’s installation Essay. This rarely heard work immerses the body in an anarchic soundscape of spoken words and empty space. Artist’s talk: Gordon Mumma. Admission $15 (or $5 for AGGV members). Advance ticket sales begin November 8th. Renowned American composer Gordon Mumma offers a screening of his documentary TIME’SPACE chronicling the rehearsals, conversations, performance and visual art of Cage from 1960–80 followed by a conversation with Mumma about his experiences with Cage and the Merce Cunningham Dance Company, and Cage’s profound impact on music, art and culture.